It's highly configurable with you easily being able to change most aspects. There's also a mini-cart display below the entry block which allows you to edit the quanties in the cart or delete items from the cart. All the data-entry is processed via ajax, so it's very quick to enter data and you get immediate results in the mini-cart block on the bottom without reposting the full page. It will also display/use relevant discounts when appropriate. Added productmatch, customermatch, language, and inventory (sub-products) logic. 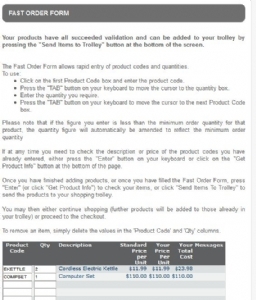 Corrected problems when after sending items to cart, some fields were still populated on the quick entry form. 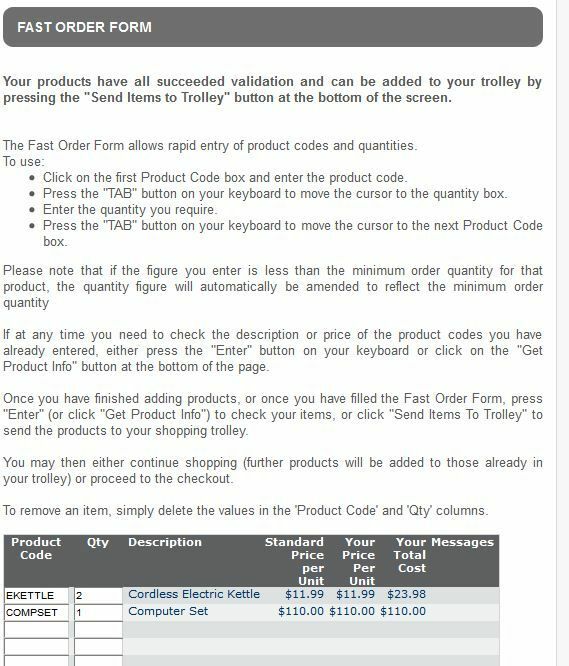 Created an extra post-change file/function to execute after the quick order screen changes the cart contents (used for customisations such as the vpasp cookie-based cart). Added shopproductinventory.asp and shopalsobought.asp includes to byz_quickorder$_config_cart_setup.asp. Added rc variable declaration to byz_quickorder_globals_inc.asp. 03 15-JUL-2009 Corrected a bug which was causing stock level checks in some instances not to work fully/correctly. 04 11-DEC-2012 Made compatible with VPASP V7. Changed to use the generic BYZ cursor opening/closing functions to help avoid cursors getting blanked-out with 8k/memo (text/ntext) bugs and to help minimise memory usage. Corrected case-sensitivity logic when matching product codes. Changed to use BYZ038 tools/functions where possible/appropriate. Upgraded BYZ038 (from V10 to V21). Upgraded BYZ036 (from V05 to V15). Please Note: If upgrading from a previous version of BYZ084, you must make sure you are using V21 or above of BYZ038 before upgrading to BYZ084 V04 or above. If upgrading from a previous version of BYZ084, please backup and then completely un-install your original version from your site, and then install the new version. Added display for the mini-cart where items can also be altered/deleted. Changed the posting process (send to trolley etc) to use ajax instead of a full screen post.